This is a bit of a drawing class, a bit of a painting class and a bit of a sculpture class. 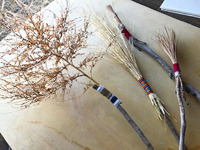 We start by making our our brushes from a variety of found materials (branches, twigs, grasses, sponges, twine, etc.) based on the kinds of marks each student is interested in making (delicate, bold, brushy). These often turn out to be beautiful artifacts in and of themselves. When the brushes are made, we'll begin to draw with inks and paints and examine how our movements affect the marks and the final works that are made. This class has always been popular because it's so personal and unique. Plus, the artwork is exceptional. Register at www.workshopsmarfa.com and see our entire schedule. •Class is 3 hours long.